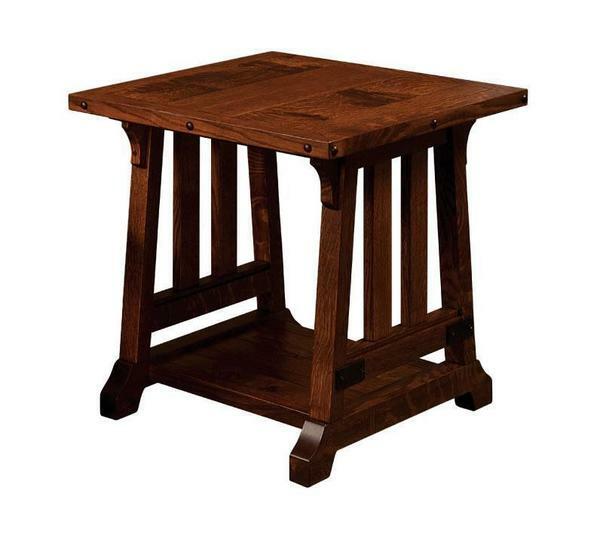 Defined by its plank-style top and delicately rustic look, the Garber End Table brings a true sense of integrity and quality to any space. The Garber's look allows it to effortlessly blend in and enhance decor almost any context, with its plank-style top and smooth, straight lines complementing both traditional and transitional rooms. Every element of the Garber is handcrafted exclusively to order from native solid wood in a small Amish woodshop in the northern United States, where our skilled woodworkers weave dedication, attention, and pride into every inch of the Garber. Taken as a whole, this really is an exceptional combination of style and substance. Every single Garber is exclusively built to order, giving the woodworkers ample room for custom changes of all shapes and sizes. If you'd like to talk about a custom order, or if you have any questions at all, please don't hesitate to contact us by phone or by email at any time - we love how seamlessly this piece infuses rustic beauty into its transitional design, and we would love to talk about it with you.